A stunning addition to any border, these tall plant supports are perfect for larger flowers and plants, preventing stems from being snapped in the wind or flopping under their own weight. If left in place over winter they will also indicate where dormant plants will emerge next season. 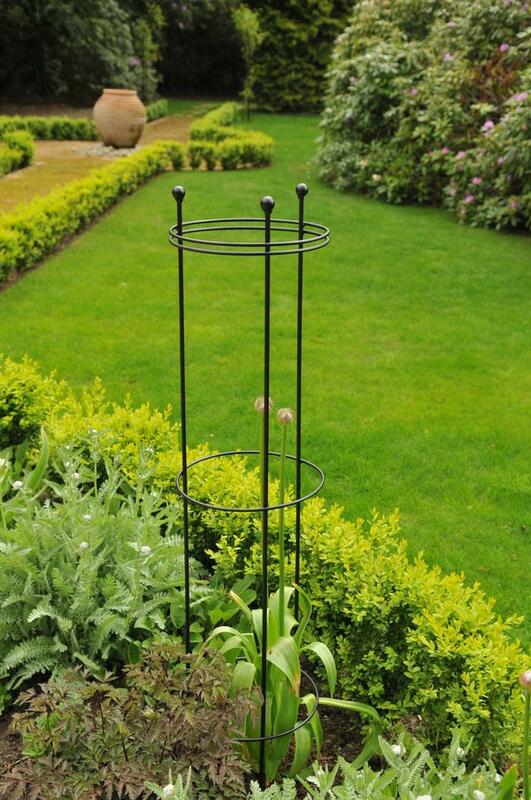 These strong plant supports are designed to be pushed 30cm into the ground so that the bottom ring is just above ground level giving superb stability and are available in 2 heights - 1m & 1.4m (height is out of the ground) and 3 diameters - 30cm, 45cm & 60cm. Exclusively designed and manufactured by us in the UK, the tall plant supports use 8mm gauge steel rod for the legs and 6mm gauge steel rod for the rings and come with a 5 YEAR STRUCTURAL GUARANTEE. Classic matt black powder coated finish or untreated steel which quickly develops an even rust coating for a long lasting weatherproof finish.